If you search the term, you will probably come up short or be lead back to one of my website pages because I frequently reference these tools which I consider to be just as important as any other quilling tool. Essentially they are cylindrical objects that can be used to wrap strips of quilling paper around to create closed coil rings. You will not find the tools I am about to talk about in any craft store or even online... however there is no reason to fret because a quick search around your home is sure to produce many options for you to use to make your creations. In in once case shown below, you will easily be able to make your own. There are an absolutely endless variety of objects that you could use for quilling forms. For the sake of this article, I am going to share with you my favorites and the tools I personally use in my daily quilling. Dowels can be found at both craft stores and hardware stores in multiple diameters. You can often ask for them to be cut down to your preferred length. My favorite length is about 4". I like to sand the ends and wrap a slick tape around one end for easy slipping. These work very well for personal work as well as designing for others due to availability. 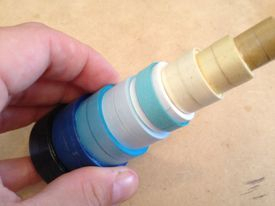 You would use these to create rings in a range of sizes to be used in jewelry making, outside flower petals and other modern quilling projects. These are obviously easy to find everywhere, however they are not really very great to use in designing for others. These large forms could be used to create larger works of art. Make large shapes to fill in or decorate. This is a tool I created to standardize my quilling patterns and tutorials for others to use. I wanted to make sure that everyone would have the opportunity to recreate my designs to an exact. The form consists of ten tiers that range from 5" in diameter to .5" diameter. It is as easy to use as any of the above forms, but it can be made by you with just quilling paper and a quilling tool. You can find the instructions to create your own by following this link. Each ring was created using a 24" strip of 1/4" quilling paper. The larger outer rings were made using bottles as forms while the smaller rings were all made using knitting needles. Now that you know how to use them and where to get or make them, it is time to put your form tools to good use. You can find a new project featuring the use of forms on our Free Projects & Tutorials Page. If you need to learn the basics before getting started, you can do so with our Quilling Shapes Tutorial. 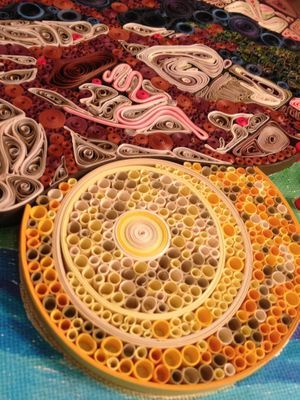 This article is the first in a series of quilling information, you can read the other articles that are currently available on our Quilling: How to.... page. If you have any other ideas or suggestions that may help others out, you can leave your feedback by contacting me below and I will get it added!